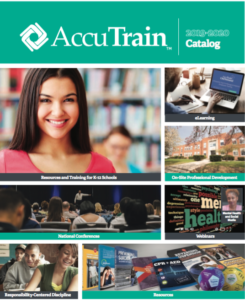 AccuTrain provides a comprehensive menu of award-winning resources, strategy-filled professional development events and transformational training programs for K-12 educators. Discover outstanding online, DVD or print training resources addressing critical health, counseling, behavior management, safety and compliance issues. 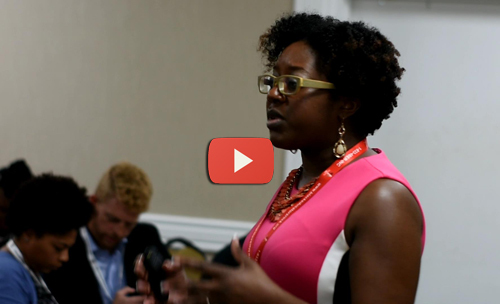 AccuTrain hosts nine topic-driven conferences featuring nationally known authors and speakers at Innovative Schools Summits in Orlando, Atlanta and Las Vegas. AccuTrain public seminars feature informative, practical content presented by authors and thought leaders in their fields. Learn supportive, non-exclusionary, deescalating behavior management techniques that teach students responsibility & transform school climate. Master trainers bring AccuTrain programs and seminars to your district or school for practical strategy-filled one- or two-day workshops. AccuTrain serves K-12 educators with insight-filled professional development events and award-winning resources. In addition to providing dozens of online, DVD and print titles, AccuTrain is a leader in providing instructor-led continuing education. Calling upon nationally known authors and experts in the areas of relational aggression, behavior management, teaching strategies, school safety and counseling techniques, AccuTrain hosts more than 200 webinars, seminars and conferences each year. The AccuTrain™ mission is to serve K-12 educators exclusively with award-winning resources and insightful professional development events. AccuTrain™ provides a comprehensive menu of resources and events for teachers, counselors, nurses, principals, deans and social workers – as well as transportation, school safety and food service personnel. Discover outstanding online, DVD-based or print-based training resources on critical health, counseling, behavior management, human resources and safety and compliance issues. High production values and accurate, well-researched content are consistent elements of each AccuTrain training resource. In addition to our library of more than 100 online and DVD courses and dozens of print-based materials, AccuTrain is a leader in providing instructor-led continuing education. Calling upon nationally renowned authors and experts in the areas of relational aggression, behavior management, groundbreaking teaching strategies, working with students with emotional/behavioral challenges, school safety and innovative counseling techniques, a host of webinars, public seminars, on-site training options and national conferences is available. AccuTrain hosts nine interest-based conferences annually at Innovative Schools Summits in Orlando, Atlanta and Las Vegas. Bestselling authors and nationally known thought leaders join innovative practitioners to present a variety of perspectives and strategies at the School Discipline Conference, the School Climate & Culture Forum, the At-Risk Students Conference, the Girl Bullying Conference, the Innovative Teaching Strategies Conference, the Wired Differently Conference, the School Safety Conference, the Counseling Strategies Conference and the Boy Brains Conference. With AccuTrain™ On-Demand, every training DVD is available via our streaming platform. Simplify distribution and documentation of training with this online option. Visit the AccuTrain On-Demand demo site to explore all the functionality of AccuTrain’s e-learning. These courses feature the same video content as AccuTrain’s award-winning DVD-based training programs and can be completed in less than 30 minutes. The 20-question quiz at the end of each course assures comprehension and provides documentation of completed training. The training adminisatrator can assign courses to trainees, track when the training is completed and see how the trainees have scored on the quiz — all from his or her desk! We offer 90-minute webinars which enable attendees to access live how-to training from experts on a variety of topics ranging from bullying to self-injury to cyber safety to manipulative students. With AccuTrain On-Demand, every training DVD is available via our streaming platform. Simplify distribution and documentation of training with this online option. Visit the AccuTrain On-Demand demo site to explore all the functionality of AccuTrain’s e-learning. These courses feature the same video content as AccuTrain’s award-winning DVD-based training programs and can be completed in less than 30 minutes. The 20-question quiz at the end of each course assures comprehension and provides documentation of completed training. The training administrator can assign courses to trainees, track when the training is completed and see how the trainees have scored on the quiz — all from his or her desk! Discover outstanding online, DVD and print-based resources for K-12 educators on social-emotional, health, counseling, behavior management, transportation and other critical safety and compliance issues. Well-researched content, high production values and practical strategies are consistent elements of each AccuTrain resource. AccuTrain seminars feature informative, practical content presented by experts who are also engaging presenters. Public seminars are hosted throughout North America from October to May. Current topics include Girl Drama; Lost Boys; Defiant, Manipulative & Attention-Seeking Students; Students Who Are Wired Differently; Critical Mental Health Challenges; and Teaching Students Self-Regulation. Over the past decade, the Responsibility-Centered Discipline program has produced remarkable results as it has been implemented across North America. To be certain, RCD schools have seen significant decreases in office referrals, detentions and suspensions. But RCD schools have also moved away from an obedience-based model to a model that is centered on students taking responsibility for their own behavior as well as their own academic success. As schools drive toward improving academic results, educators have become far more purposeful in enhancing curriculum, refining assessment and enriching instruction. But without improving classroom management, all of these other efforts will ultimately fall short of expectations. Educators understand that behavior and effort are often impacted by the relationships they have built with students. 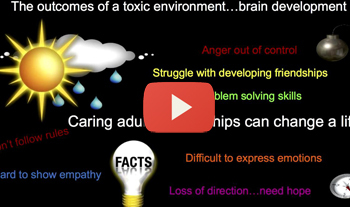 When emotions escalate, those relationships are tested — and often damaged. Responsibility- Centered Discipline helps educators to be prepared when situations come to a boil. By empowering educators to become masters of challenging moments, RCD schools typically see a significant improvement not only in behavior management, but also in school climate, student and teacher satisfaction – and ultimately academic success. Master trainers bring AccuTrain programs and seminars to your district or school for practical strategy-filled one- or two-day workshops. Topics include engaging boys, Self-Regulation, Responsibility-Centered Discipline, relational aggression, self-injury and suicide, students who are Wired Differently and trauma-informed schools.